คำจำกัดความในปี ค.ศ. 2014 นี้โดยสหพันธ์ต่อต้านโรคลมชักระหว่างประเทศ (ILAE) มีจุดประสงค์เพื่อเพิ่มความชัดเจนให้กับแนวคิดของนิยามเดิมที่บัญญัติไว้ในปี ค.ศ. 2005 ซึ่งกำหนดให้โรคลมชักหมายถึง "ความผิดปกติของสมองที่มีลักษณะเฉพาะโดยสามารถเห็นได้จาก ความโน้มเอียงของสมองที่จะส่งสัญญาณชักอย่างต่อเนื่อง และผลลัพธ์ทางด้านประสาทชีวะวิทยา การรับรู้ จิตใจ และสังคมจากการเป็นโรค โดยในนิยามนี้ผุ้ป่วยจำเป็นจะต้องมีอาการชักซึ่งเกิดจากความผิดปกติทางสมองอย่างน้อย 1 ครั้ง"
จุดที่เป็นต้นกำเนิด และ โครงข่ายประสาทซึ่งเกี่ยวข้องกับการชักที่พบบ่อย ๆ ได้รับการค้นพบว่าเป็นกลไกหลักที่เกิดขึ้นในผู้ป่วยโรคลมชักส่วนใหญ่ เริ่มมีการนำสมองส่วนต่าง ๆ และ เวลาที่สมองส่วนต่าง ๆ นั้นทำงานอย่างผิดปกติ มาเชื่อมโยงเพื่อหาคำตอบว่าโรคลมชักเกิดขึ้นได้อย่างไร. ↑ 4.0 4.1 4.2 4.3 4.4 4.5 4.6 4.7 "Epilepsy Fact sheet". WHO. February 2016. สืบค้นเมื่อ 4 March 2016. ↑ 7.0 7.1 7.2 Goldberg, EM; Coulter, DA (May 2013). "Mechanisms of epileptogenesis: a convergence on neural circuit dysfunction". Nature reviews. Neuroscience. 14 (5): 337–49. doi:10.1038/nrn3482. PMID 23595016. ↑ 8.0 8.1 Longo, Dan L (2012). "369 Seizures and Epilepsy". Harrison's principles of internal medicine (18th ed.). McGraw-Hill. p. 3258. ISBN 978-0-07-174887-2. ↑ 9.0 9.1 9.2 9.3 9.4 9.5 9.6 Pandolfo, M. (Nov 2011). "Genetics of epilepsy". Semin Neurol. 31 (5): 506–18. doi:10.1055/s-0031-1299789. PMID 22266888. ↑ 10.0 10.1 10.2 Eadie, MJ (December 2012). "Shortcomings in the current treatment of epilepsy". Expert Review of Neurotherapeutics. 12 (12): 1419–27. doi:10.1586/ern.12.129. PMID 23237349. ↑ 11.0 11.1 11.2 Bergey, GK (June 2013). "Neurostimulation in the treatment of epilepsy". Experimental neurology. 244: 87–95. doi:10.1016/j.expneurol.2013.04.004. PMID 23583414. ↑ 12.0 12.1 12.2 12.3 Martin, K; Jackson, CF; Levy, RG; Cooper, PN (9 February 2016). "Ketogenic diet and other dietary treatments for epilepsy". The Cochrane database of systematic reviews. 2: CD001903. doi:10.1002/14651858.CD001903.pub3. PMID 26859528. ↑ 13.0 13.1 GBD 2015 Disease and Injury Incidence and Prevalence Collaborators (8 October 2016). "Global, regional, and national incidence, prevalence, and years lived with disability for 310 diseases and injuries, 1990-2015: a systematic analysis for the Global Burden of Disease Study 2015". Lancet. 388 (10053): 1545–1602. doi:10.1016/S0140-6736(16)31678-6. PMC 5055577. PMID 27733282. ↑ GBD 2015 Mortality and Causes of Death Collaborators (8 October 2016). "Global, regional, and national life expectancy, all-cause mortality, and cause-specific mortality for 249 causes of death, 1980-2015: a systematic analysis for the Global Burden of Disease Study 2015". Lancet. 388 (10053): 1459–1544. doi:10.1016/s0140-6736(16)31012-1. PMID 27733281. ↑ Brodie, MJ; Elder, AT; Kwan, P (November 2009). "Epilepsy in later life". Lancet neurology. 8 (11): 1019–30. doi:10.1016/S1474-4422(09)70240-6. PMID 19800848. ↑ 17.0 17.1 Holmes, Thomas R. Browne, Gregory L. (2008). Handbook of epilepsy (4th ed.). Philadelphia: Lippincott Williams & Wilkins. p. 7. ISBN 978-0-7817-7397-3. ↑ Wyllie's treatment of epilepsy : principles and practice (5th ed.). Philadelphia: Wolters Kluwer/Lippincott Williams & Wilkins. 2010. ISBN 978-1-58255-937-7. ↑ 19.00 19.01 19.02 19.03 19.04 19.05 19.06 19.07 19.08 19.09 19.10 19.11 Newton, CR (29 September 2012). "Epilepsy in poor regions of the world". Lancet. 380 (9848): 1193–201. doi:10.1016/S0140-6736(12)61381-6. PMID 23021288. ↑ 20.0 20.1 20.2 20.3 20.4 20.5 Wilden, JA; Cohen-Gadol, AA (15 August 2012). "Evaluation of first nonfebrile seizures". American family physician. 86 (4): 334–40. PMID 22963022. ↑ Berg, AT (2008). "Risk of recurrence after a first unprovoked seizure". Epilepsia. 49 Suppl 1: 13–8. doi:10.1111/j.1528-1167.2008.01444.x. PMID 18184149. ↑ 22.0 22.1 22.2 22.3 22.4 22.5 L Devlin, A; Odell, M; L Charlton, J; Koppel, S (December 2012). "Epilepsy and driving: current status of research". Epilepsy research. 102 (3): 135–52. doi:10.1016/j.eplepsyres.2012.08.003. PMID 22981339. ↑ 23.0 23.1 Duncan, JS; Sander, JW; Sisodiya, SM; Walker, MC (1 April 2006). "Adult epilepsy" (PDF). Lancet. 367 (9516): 1087–100. doi:10.1016/S0140-6736(06)68477-8. PMID 16581409. ↑ 24.00 24.01 24.02 24.03 24.04 24.05 24.06 24.07 24.08 24.09 24.10 24.11 24.12 24.13 24.14 24.15 24.16 24.17 24.18 24.19 24.20 National Clinical Guideline Centre (January 2012). The Epilepsies: The diagnosis and management of the epilepsies in adults and children in primary and secondary care (PDF). National Institute for Health and Clinical Excellence. pp. 21–28. ↑ Hughes, JR (August 2009). "Absence seizures: a review of recent reports with new concepts". Epilepsy & behavior : E&B. 15 (4): 404–12. doi:10.1016/j.yebeh.2009.06.007. PMID 19632158. ↑ 26.0 26.1 26.2 26.3 Shearer, Peter. "Seizures and Status Epilepticus: Diagnosis and Management in the Emergency Department". Emergency Medicine Practice. ↑ 27.0 27.1 27.2 27.3 Bradley, Walter G. (2012). "67". Bradley's neurology in clinical practice (6th ed.). Philadelphia, PA: Elsevier/Saunders. ISBN 978-1-4377-0434-1. ↑ 28.0 28.1 28.2 28.3 28.4 National Clinical Guideline Centre (January 2012). The Epilepsies: The diagnosis and management of the epilepsies in adults and children in primary and secondary care (PDF). National Institute for Health and Clinical Excellence. pp. 119–129. ↑ 29.00 29.01 29.02 29.03 29.04 29.05 29.06 29.07 29.08 29.09 29.10 29.11 29.12 29.13 29.14 "Epilepsy". Fact Sheets. World Health Organization. October 2012. สืบค้นเมื่อ 24 January 2013. ↑ 30.0 30.1 30.2 Engel, Jerome (2008). Epilepsy : a comprehensive textbook (2nd ed.). Philadelphia: Wolters Kluwer Health/Lippincott Williams & Wilkins. p. 2797. ISBN 978-0-7817-5777-5. ↑ 31.0 31.1 Simon, David A. Greenberg, Michael J. Aminoff, Roger P. (2012). "12". Clinical neurology (8th ed.). New York: McGraw-Hill Medical. ISBN 978-0-07-175905-2. ↑ 32.0 32.1 Steven C. Schachter, ed. (2008). Behavioral aspects of epilepsy : principles and practice ([Online-Ausg.]. ed.). New York: Demos. p. 125. ISBN 978-1-933864-04-4. ↑ Xue, LY; Ritaccio, AL (March 2006). "Reflex seizures and reflex epilepsy". American journal of electroneurodiagnostic technology. 46 (1): 39–48. PMID 16605171. ↑ Malow, BA (November 2005). "Sleep and epilepsy". Neurologic Clinics. 23 (4): 1127–47. doi:10.1016/j.ncl.2005.07.002. PMID 16243619. ↑ Tinuper, P; Provini, F; Bisulli, F; Vignatelli, L; Plazzi, G; Vetrugno, R; Montagna, P; Lugaresi, E (August 2007). "Movement disorders in sleep: guidelines for differentiating epileptic from non-epileptic motor phenomena arising from sleep". Sleep medicine reviews. 11 (4): 255–67. doi:10.1016/j.smrv.2007.01.001. PMID 17379548. ↑ Holmes, Thomas R. (2008). Handbook of epilepsy (4th ed.). Philadelphia: Lippincott Williams & Wilkins. p. 34. ISBN 978-0-7817-7397-3. ↑ 37.0 37.1 37.2 Panayiotopoulos, CP (2010). A clinical guide to epileptic syndromes and their treatment based on the ILAE classifications and practice parameter guidelines (Rev. 2nd ed.). London: Springer. p. 445. ISBN 978-1-84628-644-5. ↑ James W. Wheless, ed. (2009). Advanced therapy in epilepsy. Shelton, Conn.: People's Medical Pub. House. p. 443. ISBN 978-1-60795-004-2. ↑ Larner, Andrew J. (2010). A dictionary of neurological signs (3rd ed.). New York: Springer. p. 348. ISBN 978-1-4419-7095-4. ↑ Kapan PW (November 2011). "Obsessive-compulsive disorder in chronic epilepsy". Epilepsy & Behavior. 22: 428–32. doi:10.1016/j.yebeh.2011.07.029. PMID 21889913. ↑ Stefan, Hermann (2012). Epilepsy Part I: Basic Principles and Diagnosis E-Book: Handbook of Clinical Neurology (Volume 107 of Handbook of Clinical Neurology ed.). Newnes. p. 471. ISBN 978-0-444-53505-4. ↑ Reilly CJ (May–June 2011). "Attention Deficit Hyperactivity Disorder (ADHD) in Childhood Epilepsy". Research in Developmental Disabilities: A Multidisciplinary Journal. 32 (3): 883–93. doi:10.1016/j.ridd.2011.01.019. PMID 21310586. ↑ Levisohn PM (2007). "The autism-epilepsy connection". Epilepsia. 48 (Suppl 9): 33–5. doi:10.1111/j.1528-1167.2007.01399.x. PMID 18047599. ↑ 47.0 47.1 47.2 47.3 47.4 47.5 47.6 Neligan, A; Hauser, WA; Sander, JW (2012). "The epidemiology of the epilepsies". Handbook of clinical neurology. 107: 113–33. doi:10.1016/B978-0-444-52898-8.00006-9. PMID 22938966. ↑ Dhavendra Kumar, ed. (2008). Genomics and clinical medicine. Oxford: Oxford University Press. p. 279. ISBN 978-0-19-972005-7. ↑ 49.00 49.01 49.02 49.03 49.04 49.05 49.06 49.07 49.08 49.09 49.10 49.11 49.12 49.13 49.14 49.15 49.16 Bhalla, D.; Godet, B.; Druet-Cabanac, M.; Preux, PM. (Jun 2011). "Etiologies of epilepsy: a comprehensive review". Expert Rev Neurother. 11 (6): 861–76. doi:10.1586/ern.11.51. PMID 21651333. ↑ Grossman G (Apr 2008). "Neurological complications of coeliac disease: what is the evidence?". Pract Neurol. 8 (2): 77–89. doi:10.1136/jnnp.2007.139717. PMID 18344378. ↑ Simon D. Shorvon (2011). The Causes of Epilepsy: Common and Uncommon Causes in Adults and Children. Cambridge University Press. p. 467. ISBN 978-1-139-49578-3. ↑ Sellner, J; Trinka, E (Oct 2012). "Seizures and epilepsy in herpes simplex virus encephalitis: current concepts and future directions of pathogenesis and management". Journal of neurology. 259 (10): 2019–30. doi:10.1007/s00415-012-6494-6. PMID 22527234. ↑ Hadjipanayis A; Hadjichristodoulou C; Youroukos S (October 1997). "Epilepsy in patients with cerebral palsy". Developmental Medicine & Child Neurology. 39: 659–63. doi:10.1111/j.1469-8749.1997.tb07359.x. PMID 9352726. ↑ 55.0 55.1 Bromfield EB (2006). An Introduction to Epilepsy. American Epilepsy Society. ↑ Blumenfeld, H (2005). "Cellular and Network Mechanisms of Spike-Wave Seizures". Epilepsia. 46 (Suppl.9): 21–33. doi:10.1111/j.1528-1167.2005.00311.x. PMID 16302873. ↑ Noebels, Jeffrey L.; Avoli, Massimo (2012-06-29). Jasper's Basic Mechanisms of the Epilepsies. Oxford University Press. pp. 466, 470. ISBN 9780199746545. สืบค้นเมื่อ 2014-10-16. ↑ 58.0 58.1 Le Van Quyen, M; Navarro, V; Martinerie, J; Baulac, M; Varela, FJ (2003). "Toward a Neurodynamical Understanding of Ictogenesis". Epilepsia. 44 (Suppl.12): 30–43. doi:10.1111/j.0013-9580.2003.12007.x. PMID 14641559. ↑ Oby, E; Janigro, D (November 2006). "The blood-brain barrier and epilepsy". Epilepsia. 47 (11): 1761–74. doi:10.1111/j.1528-1167.2006.00817.x. PMID 17116015. ↑ Somjen, George G. (2004). Ions in the Brain Normal Function, Seizures, and Stroke. New York: Oxford University Press. p. 167. ISBN 978-0-19-803459-9. ↑ 62.0 62.1 Jerome Engel, Jr.; Timothy A. Pedley, eds. (2008). Epilepsy : a comprehensive textbook (2nd ed.). Philadelphia: Wolters Kluwer Health/Lippincott Williams & Wilkins. p. 483. ISBN 978-0-7817-5777-5. ↑ 63.00 63.01 63.02 63.03 63.04 63.05 63.06 63.07 63.08 63.09 63.10 63.11 63.12 63.13 63.14 63.15 63.16 63.17 63.18 63.19 63.20 63.21 63.22 63.23 63.24 63.25 63.26 63.27 63.28 63.29 National Clinical Guideline Centre (January 2012). The Epilepsies: The diagnosis and management of the epilepsies in adults and children in primary and secondary care (PDF). National Institute for Health and Clinical Excellence. pp. 57–83. ↑ Panayiotopoulos, CP (December 2011). "The new ILAE report on terminology and concepts for organization of epileptic seizures: a clinician's critical view and contribution". Epilepsia. 52 (12): 2155–60. doi:10.1111/j.1528-1167.2011.03288.x. PMID 22004554. ↑ 66.0 66.1 "Proposal for revised classification of epilepsies and epileptic syndromes. Commission on Classification and Terminology of the International League Against Epilepsy". Epilepsia. 30 (4): 389–99. 1989. doi:10.1111/j.1528-1157.1989.tb05316.x. PMID 2502382. ↑ Engel J (2006). "ILAE classification of epilepsy syndromes". Epilepsy Res. 70 (Suppl 1): 5–10. doi:10.1111/j.1528-1157.1981.tb06159.x. PMID 16822650. ↑ 69.0 69.1 69.2 69.3 69.4 69.5 Shorvon SD (2011). "The etiologic classification of epilepsy". Epilepsia. 52 (6): 1052–1057. doi:10.1111/j.1528-1167.2011.03041.x. ↑ "Epilepsy syndromes". International league against epilepsy. สืบค้นเมื่อ 2014-10-06. ↑ Nordli DR jr (2012). "Epileptic encephalopathies in infants and children". J Clin Neurophysiol. 29 (5): 420–4. doi:10.1097/WNP.0b013e31826bd961. PMID 23027099. ↑ Gemma L Carvill; Sinéad B Heavin; Simone C Yendle; Jacinta M McMahon; Brian J O'Roak; Joseph Cook; Adiba Khan; Michael O Dorschner; Molly Weaver; Sophie Calvert; Stephen Malone; Geoffrey Wallace; Thorsten Stanley; Ann M E Bye; Andrew Bleasel; Katherine B Howell; Sara Kivity; Mark T Mackay; Victoria Rodriguez-Casero; Richard Webster; Amos Korczyn; Zaid Afawi; Nathanel Zelnick; Tally Lerman-Sagie; Dorit Lev; Rikke S Møller; Deepak Gill; Danielle M Andrade; Jeremy L Freeman; Lynette G Sadleir; Jay Shendure; Samuel F Berkovic; Ingrid E Scheffer; Heather C Mefford (2013). "Targeted resequencing in epileptic encephalopathies identifies de novo mutations in CHD2, SYNGAP1". Nature Genetics. 45: 825–830. doi:10.1038/ng.2646. PMC 3704157. PMID 23708187. ↑ EuroEPINOMICS-RES Consortium (2014). "De Novo Mutations in Synaptic Transmission Genes Including DNM1 Cause Epileptic Encephalopathies". Am J Hum Genet. 95 (4): 360–370. doi:10.1016/j.ajhg.2014.08.013. PMC 4185114. PMID 25262651. ↑ Luef, G (October 2010). "Hormonal alterations following seizures". Epilepsy & behavior : E&B. 19 (2): 131–3. doi:10.1016/j.yebeh.2010.06.026. PMID 20696621. ↑ Brodtkorb, E (2013). "Common imitators of epilepsy". Acta Neurologica Scandinavica. Supplementum. 127 (196): 5–10. doi:10.1111/ane.12043. PMID 23190285. ↑ 83.0 83.1 83.2 83.3 John A. Marx, ed. (2010). Rosen's emergency medicine : concepts and clinical practice (7th ed.). Philadelphia: Mosby/Elsevier. p. 2228. ISBN 978-0-323-05472-0. ↑ Zhou, J. Q.; Zhou, L. M.; Fang, Z. Y.; Wang, Q.; Chen, Z. Y.; Yang, L. B.; Chen, S. D.; Cai, X. D. (2011). "Analyzing clinical and electrophysiological characteristics of Paroxysmal Dyskinesia". Journal of Research in Medical Sciences. 16 (1): 110–114. PMC 3063430. PMID 21448393. ↑ Akhtar MJ (2002). "All seizures are not epilepsy: many have a cardiovascular cause". J Pak Med Assoc. 52 (3): 1116–20. PMID 12071066. ↑ 88.0 88.1 Jerome, Engel (2013). Seizures and epilepsy (2nd ed.). New York: Oxford University Press. p. 462. ISBN 9780195328547. ↑ 89.0 89.1 89.2 89.3 Michael, GE. ; O'Connor, RE. (Feb 2011). "The diagnosis and management of seizures and status epilepticus in the prehospital setting". Emerg Med Clin North Am. 29 (1): 29–39. doi:10.1016/j.emc.2010.08.003. PMID 21109100. ↑ James W. Wheless; James Willmore; Roger A. Brumback (2009). Advanced therapy in epilepsy. Shelton, Conn.: People's Medical Pub. House. p. 144. ISBN 9781607950042. ↑ 91.0 91.1 91.2 National Clinical Guideline Centre (January 2012). The Epilepsies: The diagnosis and management of the epilepsies in adults and children in primary and secondary care (PDF). National Institute for Health and Clinical Excellence. ↑ Elaine Wyllie (2012). Wyllie's Treatment of Epilepsy: Principles and Practice. Lippincott Williams & Wilkins. p. 187. ISBN 978-1-4511-5348-4. ↑ Steven R. Flanagan; Herb Zaretsky; Alex Moroz, eds. (2010). Medical aspects of disability; a handbook for the rehabilitation professional (4th ed.). New York: Springer. p. 182. ISBN 978-0-8261-2784-6. ↑ Nolan, SJ; Marson, AG; Pulman, J; Tudur Smith, C (23 August 2013). "Phenytoin versus valproate monotherapy for partial onset seizures and generalised onset tonic-clonic seizures". The Cochrane database of systematic reviews. 8: CD001769. doi:10.1002/14651858.CD001769.pub2. PMID 23970302. ↑ Tudur Smith, C; Marson, AG; Clough, HE; Williamson, PR (2002). "Carbamazepine versus phenytoin monotherapy for epilepsy". The Cochrane database of systematic reviews (2): CD001911. doi:10.1002/14651858.CD001911. PMID 12076427. ↑ Powell, G; Saunders, M; Marson, AG (20 January 2010). "Immediate-release versus controlled-release carbamazepine in the treatment of epilepsy". The Cochrane database of systematic reviews (1): CD007124. doi:10.1002/14651858.CD007124.pub2. PMID 20091617. ↑ Ilangaratne, NB; Mannakkara, NN; Bell, GS; Sander, JW (Dec 1, 2012). "Phenobarbital: missing in action". Bulletin of the World Health Organization. 90 (12): 871–871A. doi:10.2471/BLT.12.113183. PMC 3524964. PMID 23284189. ↑ 99.0 99.1 99.2 99.3 99.4 99.5 Perucca, P; Gilliam, FG (September 2012). "Adverse effects of antiepileptic drugs". Lancet neurology. 11 (9): 792–802. doi:10.1016/S1474-4422(12)70153-9. PMID 22832500. ↑ 100.0 100.1 Weston, Jennifer; Bromley, Rebecca; Jackson, Cerian F.; Adab, Naghme; Clayton-Smith, Jill; Greenhalgh, Janette; Hounsome, Juliet; McKay, Andrew J.; Tudur Smith, Catrin (2016-11-07). "Monotherapy treatment of epilepsy in pregnancy: congenital malformation outcomes in the child". The Cochrane Database of Systematic Reviews. 11: CD010224. doi:10.1002/14651858.CD010224.pub2. ISSN 1469-493X. PMID 27819746. ↑ 101.0 101.1 Kamyar, M.; Varner, M. (Jun 2013). "Epilepsy in pregnancy". Clin Obstet Gynecol. 56 (2): 330–41. doi:10.1097/GRF.0b013e31828f2436. PMID 23563876. ↑ Lawrence S. Neinstein, ed. (2008). Adolescent health care : a practical guide (5th ed.). Philadelphia: Lippincott Williams & Wilkins. p. 335. ISBN 978-0-7817-9256-1. ↑ Duncan, JS; Sander, JW; Sisodiya, SM; Walker, MC (1 April 2006). "Adult epilepsy". Lancet. 367 (9516): 1087–100. doi:10.1016/S0140-6736(06)68477-8. PMID 16581409. ↑ 104.0 104.1 104.2 104.3 104.4 Duncan, JS (April 2007). "Epilepsy surgery". Clinical Medicine. London. 7 (2): 137–42. doi:10.7861/clinmedicine.7-2-137. PMID 17491501. ↑ 106.0 106.1 Levy, RG; Cooper, PN; Giri, P (14 March 2012). "Ketogenic diet and other dietary treatments for epilepsy". The Cochrane database of systematic reviews. 3: CD001903. doi:10.1002/14651858.CD001903.pub2. PMID 22419282. ↑ Arida, RM; Scorza, FA; Scorza, CA; Cavalheiro, EA (March 2009). "Is physical activity beneficial for recovery in temporal lobe epilepsy? Evidences from animal studies". Neuroscience and biobehavioral reviews. 33 (3): 422–31. doi:10.1016/j.neubiorev.2008.11.002. PMID 19059282. ↑ Arida, RM; Cavalheiro, EA; da Silva, AC; Scorza, FA (2008). "Physical activity and epilepsy: proven and predicted benefits". Sports medicine (Auckland, N.Z.). 38 (7): 607–15. doi:10.2165/00007256-200838070-00006. PMID 18557661. ↑ Verrotti, A; Tocco, AM; Salladini, C; Latini, G; Chiarelli, F (November 2005). "Human photosensitivity: from pathophysiology to treatment". European Journal of Neurology. 12 (11): 828–41. doi:10.1111/j.1468-1331.2005.01085.x. PMID 16241971. ↑ Tan, G; Thornby, J; Hammond, DC; Strehl, U; Canady, B; Arnemann, K; Kaiser, DA (July 2009). 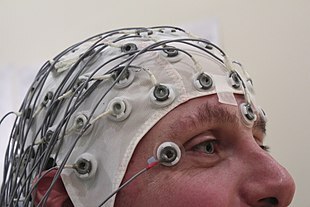 "Meta-analysis of EEG biofeedback in treating epilepsy". Clinical EEG and Neuroscience. 40 (3): 173–9. doi:10.1177/155005940904000310. PMID 19715180. ↑ Doherty, MJ; Haltiner, AM (23 January 2007). "Wag the dog: skepticism on seizure alert canines". Neurology. 68 (4): 309. doi:10.1212/01.wnl.0000252369.82956.a3. PMID 17242343. ↑ Cheuk, DK; Wong, V (7 May 2014). "Acupuncture for epilepsy". The Cochrane database of systematic reviews. 5 (4): CD005062. doi:10.1002/14651858.CD005062.pub4. PMID 24801225. ↑ Ramaratnam, S; Baker, GA; Goldstein, LH (16 July 2008). "Psychological treatments for epilepsy". The Cochrane database of systematic reviews (3): CD002029. doi:10.1002/14651858.CD002029.pub3. PMID 18646083. ↑ Ranganathan, LN; Ramaratnam, S (18 April 2005). "Vitamins for epilepsy". The Cochrane database of systematic reviews (2): CD004304. doi:10.1002/14651858.CD004304.pub2. PMID 15846704. ↑ Ramaratnam, S; Sridharan, K; Panebianco, M (2 May 2015). "Yoga for epilepsy". The Cochrane database of systematic reviews. 5 (3): CD001524. doi:10.1002/14651858.CD001524.pub2. PMID 25934967. ↑ Gloss, D; Vickrey, B (5 March 2014). "Cannabinoids for epilepsy". The Cochrane database of systematic reviews. 3: CD009270. doi:10.1002/14651858.CD009270.pub3. PMID 24595491. ↑ Belendiuk, KA; Baldini, LL; Bonn-Miller, MO (21 April 2015). "Narrative review of the safety and efficacy of marijuana for the treatment of commonly state-approved medical and psychiatric disorders". Addiction science & clinical practice. 10 (1): 10. doi:10.1186/s13722-015-0032-7. PMC 4636852. PMID 25896576. ↑ 121.0 121.1 Brigo, F; Igwe, SC (17 March 2016). "Melatonin as add-on treatment for epilepsy". The Cochrane database of systematic reviews. 3: CD006967. doi:10.1002/14651858.CD006967.pub3. PMID 26986179. ↑ 122.0 122.1 Kwan, Patrick (2012). Fast facts : epilepsy (5th ed.). Abingdon, Oxford, UK: Health Press. p. 10. ISBN 1-908541-12-1. ↑ 125.0 125.1 Bagary, M (April 2011). "Epilepsy, antiepileptic drugs and suicidality". Current opinion in neurology. 24 (2): 177–82. doi:10.1097/WCO.0b013e328344533e. PMID 21293270. ↑ Mula, M; Sander, JW (August 2013). "Suicide risk in people with epilepsy taking antiepileptic drugs". Bipolar disorders. 15 (5): 622–7. doi:10.1111/bdi.12091. PMID 23755740. ↑ 127.0 127.1 Ryvlin, P; Nashef, L; Tomson, T (May 2013). "Prevention of sudden unexpected death in epilepsy: a realistic goal?". Epilepsia. 54 Suppl 2: 23–8. doi:10.1111/epi.12180. PMID 23646967. ↑ 129.0 129.1 Sander JW (2003). "The epidemiology of epilepsy revisited". Current Opinion in Neurology. 16 (2): 165–70. doi:10.1097/00019052-200304000-00008. PMID 12644744. ↑ 130.0 130.1 130.2 130.3 130.4 130.5 130.6 130.7 Saraceno, B; Avanzini, G; Lee, P, eds. (2005). Atlas: Epilepsy Care in the World (PDF). World Health Organization. ISBN 92-4-156303-6. สืบค้นเมื่อ 20 December 2013. ↑ "Epilepsy: An historical overview". World Health Organization. Feb 2001. Archived from the original on 30 October 2013. สืบค้นเมื่อ 27 December 2013. ↑ "Epilepsy: historical overview". World Health Organization. สืบค้นเมื่อ 2011-03-20. ↑ 134.0 134.1 Temkin, Owsei. The Falling Sickness: A History of Epilepsy from the Greeks to the Beginnings of Modern Neurology (in อังกฤษ). JHU Press. p. Section 1. ISBN 9781421400532. ↑ Stol, Marten (1993). Epilepsy in Babylonia (in อังกฤษ). BRILL. p. 143. ISBN 9072371631. ↑ Harding, Graham F. A.; Jeavons, Peter M. (1994). Photosensitive Epilepsy (in อังกฤษ). Cambridge University Press. p. 2. ISBN 9781898683025. ↑ 137.0 137.1 Jilek-Aall, L (1999). "Morbus sacer in Africa: some religious aspects of epilepsy in traditional cultures". Epilepsia. 40 (3): 382–6. doi:10.1111/j.1528-1157.1999.tb00723.x. PMID 10080524. ↑ Illes, Judika (2011-10-11). Encyclopedia of Mystics, Saints & Sages. HarperCollins. p. 1238. ISBN 978-0-06-209854-2. สืบค้นเมื่อ 26 February 2013. Saint Valentine is invoked for healing as well as love. He protects against fainting and is requested to heal epilepsy and other seizure disorders. In northern Italy, epilepsy was once traditionally known as Saint Valentine's Malady. ↑ E. Martin Caravati (2004). Medical toxicology (3. ed.). Philadelphia [u.a. ]: Lippincott Williams & Wilkins. p. 789. ISBN 978-0-7817-2845-4. ↑ 140.0 140.1 de Boer, HM (Dec 2010). "Epilepsy stigma: moving from a global problem to global solutions". Seizure : the journal of the British Epilepsy Association. 19 (10): 630–6. doi:10.1016/j.seizure.2010.10.017. PMID 21075013. ↑ Martindale, JL; Goldstein, JN; Pallin, DJ (February 2011). "Emergency department seizure epidemiology". Emergency medicine clinics of North America. 29 (1): 15–27. doi:10.1016/j.emc.2010.08.002. PMID 21109099. ↑ 142.0 142.1 142.2 142.3 Jerome Engel, Jr.; Timothy A. Pedley, eds. (2008). Epilepsy : a comprehensive textbook (2nd ed.). Philadelphia: Wolters Kluwer Health/Lippincott Williams & Wilkins. p. 2279. ISBN 978-0-7817-5777-5. ↑ Bor, Robert (2012). Aviation Mental Health: Psychological Implications for Air Transportation. Ashgate Publishing. p. 148. ISBN 978-1-4094-8491-2. ↑ 144.0 144.1 "Seizure Disorders". Transport Canada. Government of Canada. สืบค้นเมื่อ 29 December 2013. ↑ Wilner, Andrew N. (2008). Epilepsy 199 answers : a doctor responds to his patients' questions (3rd ed.). New York: Demos Health. p. 52. ISBN 978-1-934559-96-3. ↑ "Guide for Aviation Medical Examiners". Federal Aviation Administration. สืบค้นเมื่อ 29 December 2013. ↑ 147.0 147.1 "National PPL (NPPL) Medical Requirements". Civil Aviation Authority. สืบค้นเมื่อ 29 December 2013. ↑ Drivers Medical Group (2013). "For Medical Practitioners: At a glance Guide to the current Medical Standards of Fitness to Drive" (PDF). p. 8. สืบค้นเมื่อ 29 December 2013. ↑ "Epilepsy Foundation of America - EFA". Healthfinder.gov. US Department of Health and Human Services. 28 April 2011. สืบค้นเมื่อ 28 July 2014. ↑ 151.0 151.1 Carney, PR. ; Myers, S.; Geyer, JD. (Dec 2011). "Seizure prediction: methods". Epilepsy Behav. 22 Suppl 1: S94–101. doi:10.1016/j.yebeh.2011.09.001. PMC 3233702. PMID 22078526. ↑ Jerome Engel, ed. (2008). Epilepsy : a comprehensive textbook (2nd ed.). Philadelphia: Wolters Kluwer Health/Lippincott Williams & Wilkins. p. 426. ISBN 9780781757775. ↑ Walker, MC. ; Schorge, S.; Kullmann, DM. ; Wykes, RC. ; Heeroma, JH. ; Mantoan, L. (Sep 2013). "Gene therapy in status epilepticus". Epilepsia. 54 Suppl 6: 43–5. doi:10.1111/epi.12275. PMID 24001071. ↑ Walker, L; Pirmohamed, M; Marson, AG (27 June 2013). "Immunomodulatory interventions for focal epilepsy syndromes". The Cochrane database of systematic reviews. 6: CD009945. doi:10.1002/14651858.CD009945.pub2. PMID 23803963. ↑ Quigg, M; Rolston, J; Barbaro, NM (Jan 2012). "Radiosurgery for epilepsy: clinical experience and potential antiepileptic mechanisms". Epilepsia. 53 (1): 7–15. doi:10.1111/j.1528-1167.2011.03339.x. PMC 3519388. PMID 22191545. ↑ Pedersen, Mangor; Curwood, Evan K; Vaughan, David N; Omidvarnia, Amir H; Jackson, Graeme D (2016). "Abnormal Brain Areas Common to the Focal Epilepsies: Multivariate Pattern Analysis of fMRI". Brain connectivity. doi:10.1089/brain.2015.0367. PMID 26537783. Lay summary. Patients with extratemporal focal epilepsy have common areas of abnormality (ReHo and DCw measures), including the ipsilateral piriform cortex, temporal neocortex, and ventromedial prefrontal cortex. ReHo shows additional increase in the "salience network" that includes anterior insula and anterior cingulate cortex. DCw showed additional effects in the ipsilateral thalamus and striatum. These brain areas may represent key regional network properties underlying focal epilepsy. ↑ Mormann, F; Andrzejak, RG; Elger, CE; Lehnertz, K (February 2007). "Seizure prediction: the long and winding road". Brain : a journal of neurology. 130 (Pt 2): 314–33. doi:10.1093/brain/awl241. PMID 17008335. ↑ Thomas, WB (January 2010). "Idiopathic epilepsy in dogs and cats". Veterinary Clinics of North America, Small Animal Practice. 40 (1): 161–79. doi:10.1016/j.cvsm.2009.09.004. PMID 19942062. ↑ Thomas, WB (Jan 2010). "Idiopathic epilepsy in dogs and cats". The Veterinary Clinics of North America. Small Animal Practice. 40 (1): 161–79. doi:10.1016/j.cvsm.2009.09.004. PMID 19942062. ↑ Rundfeldt, C; Loescher, W (January 2014). "The pharmacology of imepitoin: The first partial benzodiazepine receptor agonist developed for the treatment of epilepsy". CNS Drugs. 28 (1): 29–43. doi:10.1007/s40263-013-0129-z. PMID 24357084. ↑ van der Ree, M; Wijnberg, I (2012). "A review on epilepsy in the horse and the potential of Ambulatory EEG as a diagnostic tool". The Veterinary quarterly. 32 (3–4): 159–67. doi:10.1080/01652176.2012.744496. PMID 23163553. หน้านี้แก้ไขล่าสุดเมื่อวันที่ 4 กุมภาพันธ์ 2562 เวลา 19:24 น.